Southside Appliances makes every attempt to get your appliance up and running the same day you call us. While most issues are fixed the same day, our goal is to complete every repair job within 48 hours. Our exceptional service continues to be the foundation of our company. The many repeat customers we have had over the years are a testament to our high-quality workmanship. Call us today and find out why Southside Appliances is Edmonton’s expert in appliance repair. Is Your Dishwasher a Disaster? Get the best in appliance repair! Southside Appliances is Edmonton’s experienced repair team. We can fix any name brand appliance from washers, to refrigerators and more. If you need a dishwasher or garbage disposal installed, let us do the dirty work. We offer same-day service whenever possible. Southside Appliances boasts a fully credentialed and licensed journeyman technician. Our two decades of experience will get your job done correctly and efficiently. If you need a specific part, Southside Appliances can take care of that, too! We have parts for both new and old appliances. 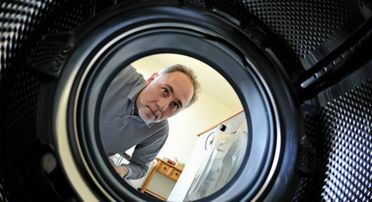 Ask about our dryer safety inspection and service.